Wimbledon continues to be the most prestigious tennis Grand Slam and is widely considered to be the most popular sporting event in the World. The unique atmosphere of Wimbledon provides spectators with unrivalled hospitality as they take in all the action from Centre and No.1 court. Day 5 of The Championships will feature men's and ladies' 3rd round singles matches including doubles matches if time allows for it. Previous champion Novak Djokovic will be out to lift that trophy once more with Roger Federer, Andy Murray and Rafael Nadal all fighting to overcome the No.1 men's single seed. In the ladies singles the leading lights will all be in the mix in 2019 including Serena Williams, Agnieska Radwanska, Sabine Lisicki and Na Li all vying for the coveted title. 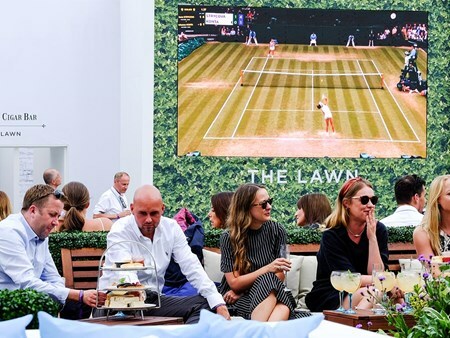 We are proud to offer unparalleled Wimbledon VIP packages, offering you the opportunity to sit back and soak up the electric atmosphere and glamour that surrounds this famous SW19 venue. Each suite caters for 10 or 20 guests, with a spacious, private balcony offering a unique vantage point above the crowds. You’ll also benefit from a concierge service, chauffeur, and a personal hostess will be on-hand to ensure every detail is covered for an unforgettable experience. When the tennis action commences, you can move seamlessly from entertaining guests in your suite to your prime-location Centre Court seats, just seconds away. To complete this first-class official tennis hospitality package, you’ll enjoy gourmet products synonymous with Wimbledon such as vintage Champagne, afternoon tea, strawberries and cream, as well as fine wines, a canapé reception and a four-course à la carte menu. 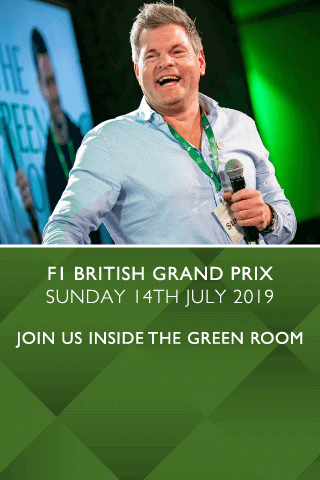 The Lawn (previously Gatsby Club) is a spacious facility offering first-class, official hospitality at The Championships, Wimbledon. Here, you’ll be immersed in the relaxed atmosphere on a private table for you and your guests, to guarantee you an unforgettable experience. 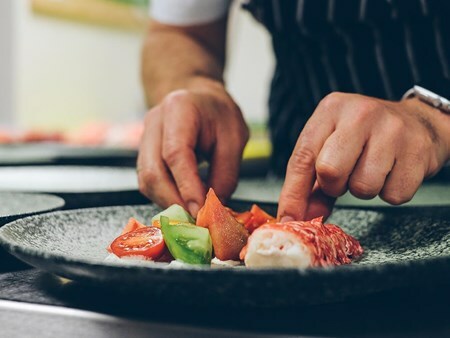 You’ll enjoy an á la carte menu designed and prepared by renowned Michelin-starred chef Albert Roux OBE, alongside son Michel Roux Jr. and granddaughter Emily Roux. Throughout the day you can soak up the glorious sunshine in the garden, whilst sipping on bespoke cocktails, dipping your toes in the foot stream and being serenaded by live musicians. Once play commences on court, the action is just a short walk or buggy ride away. Private tables available for 2 to 14. Bookings cannot be taken for odd numbers. The Rosewater Pavilion is a new addition to the official hospitality offering at The Championships, Wimbledon. 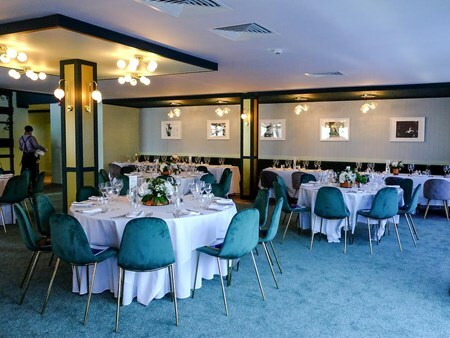 Beautifully landscaped gardens, subtle floral touchpoints, and British-inspired four course á la carte food and drinks menus personify the theme of tennis in an English garden, all making for an unforgettable experience. From relaxed informal lounges to private areas, the Rosewater Pavilion is the most flexible hospitality option, privately catering for groups of 2-12 guests. The hand-picked, attentive front-of-house team are on hand to ensure your every requirement is taken care of. Conveniently located within the grounds, the Rosewater Pavilion also offers you and your guests a stunning outdoor terrace with views of Centre Court. And once play commences on Centre Court, you have just a short stroll to take your allocated courtside seats. 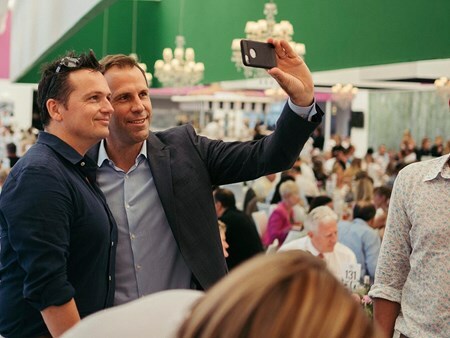 The Players’ Tables offer you and your guests a once-in-a-lifetime, official hospitality experience at The Championships, Wimbledon. Upon arrival you’ll settle into your private booth for 10-12 guests, located at our award-winning facility; The Lawn, before having the opportunity to meet and speak with a tennis celebrity. You and your guests will be treated to a fine dining experience, accompanied by equally fine wines, impeccable service, and a beautiful garden where you can relax and unwind. When play commences on-court, you’ll have a buggy to transport you straight to the gates, where you’ll take your courtside seat to watch some world-class tennis. Can't find your favourite Wimbledon - Day 5 package?